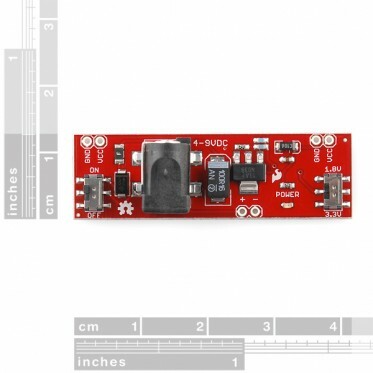 Description: This is a very simple board that takes a 4-9V input voltage and outputs a selectable 1.8V or 3.3V regulated voltage. All headers are 0.1" pitch for simple insertion into a breadboard. Input power can be supplied to either the DC barrel jack or the two pin header labeled + and -. Output power is supplied to the pins labeled GND and VCC. Board has both an On/Off switch and a voltage select switch (3.3V/1.8V). The two pairs of GND and VCC pins are spaced such that when connected to our Basic Breadboard both power busses will be powered.